A paper published today in the journal Paleoceanography finds that Atlantic Ocean surface temperatures have significantly cooled over the past millennium, since the Medieval Warming Period from about 950-1200 AD. Summer-Fall Sea Surface Temperatures (SSTs) shown in top graph. Iceland Sea Surface temperatures have also declined over the past 1200 years (4th graph). Note also the significant increase of solar irradiance from the Little Ice Age 1550-1850 to the latter 20th century (5th graph). 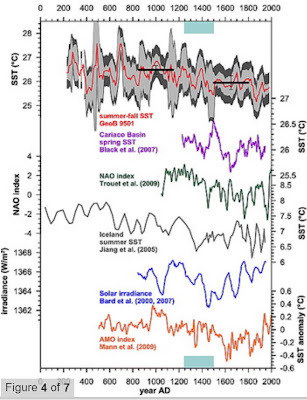 Multidecadal variations in Atlantic sea surface temperatures (SST) influence the climate of the Northern Hemisphere. 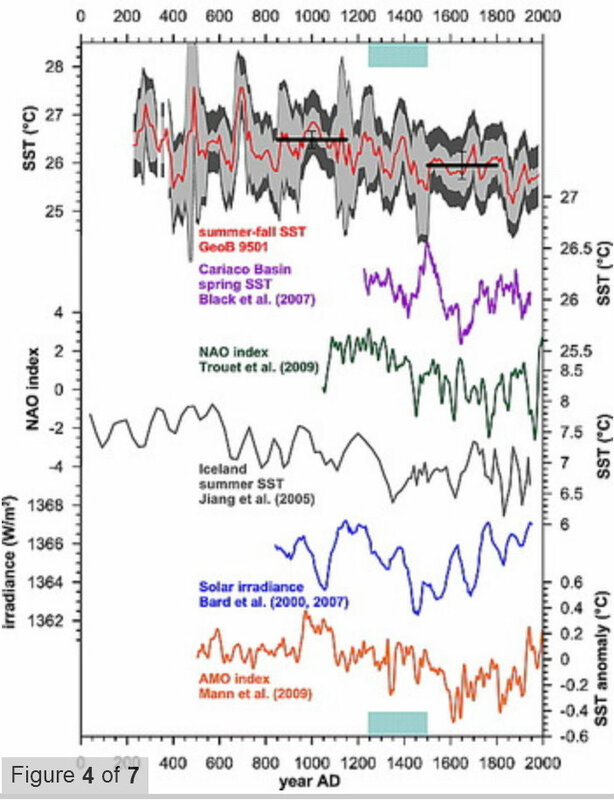 However, prior to the instrumental time period, information on multidecadal climate variability becomes limited, and there is a particular scarcity of sufficiently resolved SST reconstructions. Here we present an eastern tropical North Atlantic reconstruction of SSTs based on foraminiferal Mg/Ca ratios that resolves multidecadal variability over the past 1700 years. Spectral power in the multidecadal band (50 to 70 years period) is significant over several time intervals suggesting that the Atlantic Multidecadal Oscillation (AMO) has been influencing local SST. Since our data exhibit high scatter the absence of multidecadal variability in the remaining record does not exclude the possibility that SST variations on this time scale might have been present without being detected in our data. Cooling by ∼0.5°C takes place between about AD 1250 and AD 1500; while this corresponds to the inception of the Little Ice Age (LIA), the end of the LIA is not reflected in our record and SST remains relatively low. This transition to cooler SSTs parallels the previously reconstructed shift in the North Atlantic Oscillation toward a low pre-20th century mean state and possibly reflects common solar forcing. All the good paleo studies seem to show that modern temps are not elevated. It leads me to believe that the instrumental record is an artifact of the way we measure and the method for compiling the series.